Cost: Only $18 per class if you pre-pay for the full 8-week session ($144) at the end of the first class (The pay-per-class cost will be $25). Beginner - No experience necessary! More advanced students are welcome to join and are sure to be challenged (I will introduce more difficult parts for those who are ready for them!). I provide simple, nonwestern musical notation of all the rhythms as memory and practice aids. Intermediate - You must me able to demonstrate basic proficiency on the jembe as well as dununs and their associated bells. In short, you must be able to “keep up” with students who have been in formal studies with me for at least 8 weeks. Feel free to call me with any questions about which class will be the best fit! Advanced - My advanced students have been studying with me continuously for up to 23 years! They are not professional level players, but they can quickly pick up very complex parts and sequences. To join this class you must be able to “keep up” with students who have been in formal studies with me for many years! My classes offer an intimate and social experience of an ancient and highly developed communal art-form unique to the cultures of West Africa. Playing the intricately meshing polyrhythms, for which this music has become so universally appreciated, promotes physical and mental coordination and focus. It aids in harmonizing the functions of the two hemispheres of the brain, and advances spatial and temporal acuity — one’s ability to conceptualize time, space and matter in three dimensions. Scientific tests have shown that drumming even increases one’s white blood cell count...but, I digress! Classes run for 8 weeks, meeting once a week. 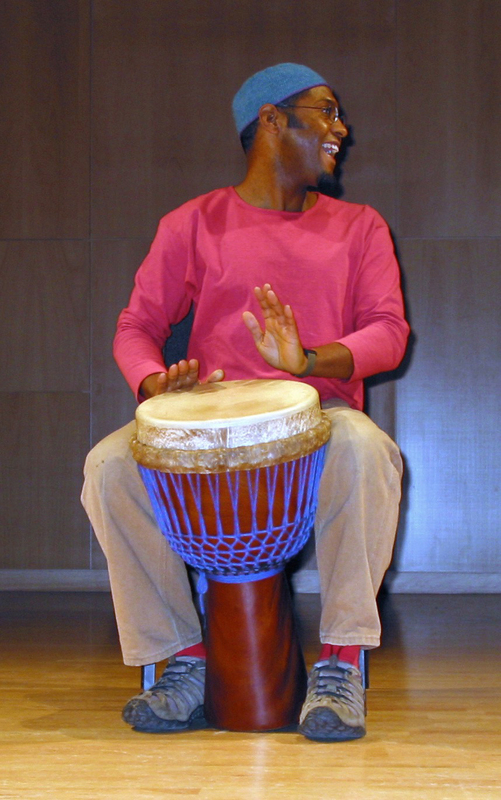 I teach all of the various parts of a traditional orchestral rhythm structure from Guinea, Mali, or Senegal, West Africa, including the song that accompanies the rhythm. The average "rhythm structure" from this tradition contains at least 9 parts played on jembes, dununba, sangban, kenkeni (names of different drums), and bells simultaneously!! When all of these parts (and the people playing them!) "sync up" and flow together, it really is truly magical! What a feeling!! This music, like all rich percussion traditions, is about melody just as much as it is about rhythm. Hence, there is great emphasis placed on learning the proper hand techniques that will allow students to make the various sounds with which the drums speak — essentially, the vowels and consonants of drum language. Proper technique also allows us to play as long as we want, without bruised or otherwise injured hands! Each week we build on and refine the previously reviewed material and learn new parts. Once we have a solid and musical foundation, I teach some techniques for improvising and we all have some fun with soloing! I strongly encourage students to commit to the whole 8-week series. This allows for a cohesive ensemble and not too much back-stepping, making possible a much deeper exploration of the music. Contact John Today to Reserve Your Spot!